I had a good run of giveaways there. I was considering whether I could do an entire month of giveaways but quickly discounted that by writing this post. Although, to be fair, this was a recipe I discovered while previously reviewing a cookbook. This soup, in its original incarnation, belongs to Angela from within The Oh She Glows Cookbook. 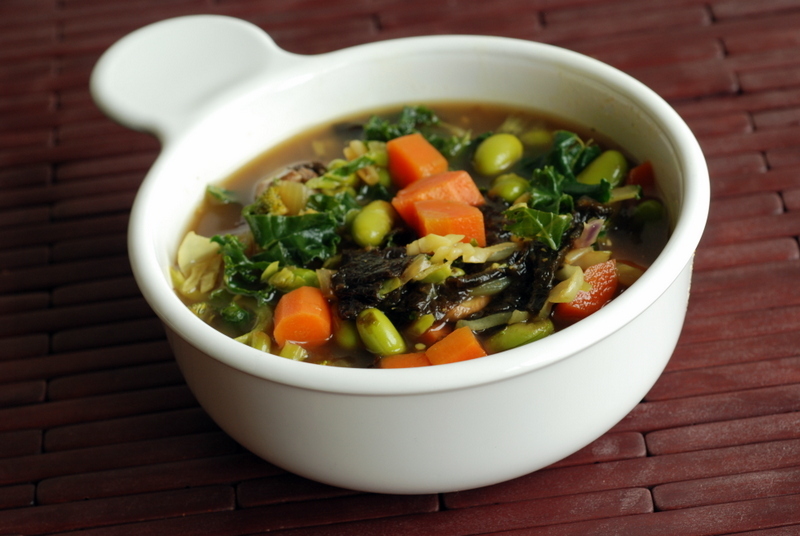 While I love the glo bar recipe I shared earlier, this is the soup I keep returning to, time and time again. I have a hard time explaining what the soup is. 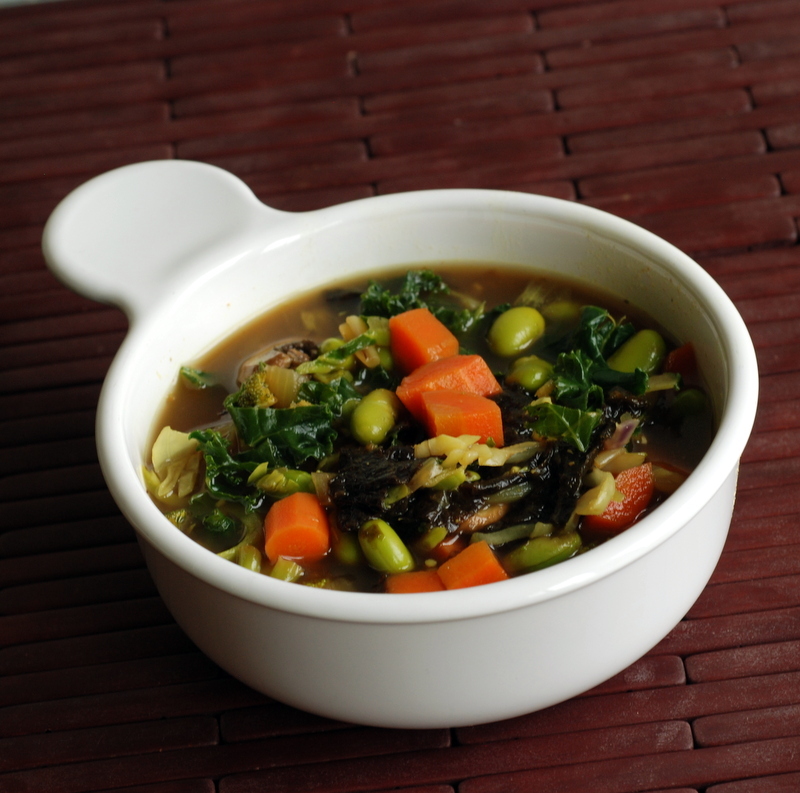 Angela called it a detox soup which makes me cringe, but it is filled with a nicely fragrant broth made from ginger, cumin with a touch of cinnamon and filled with loads and loads of vegetables. 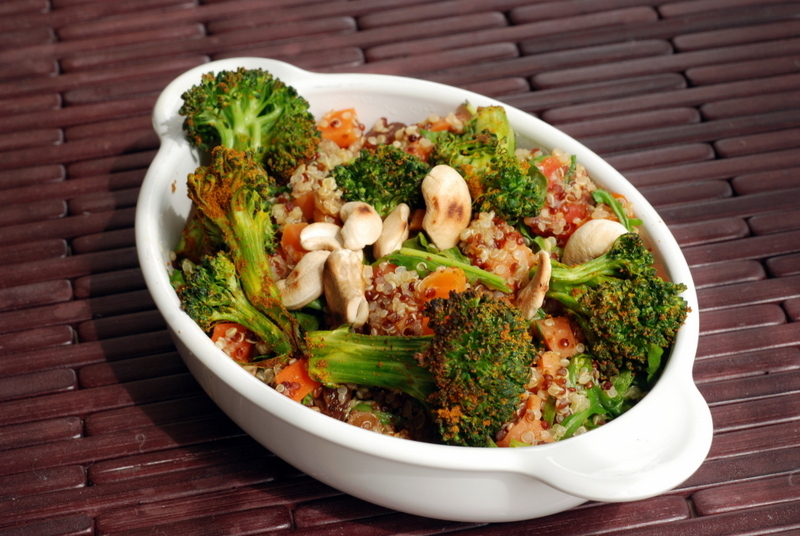 Mushrooms, broccoli and carrot. 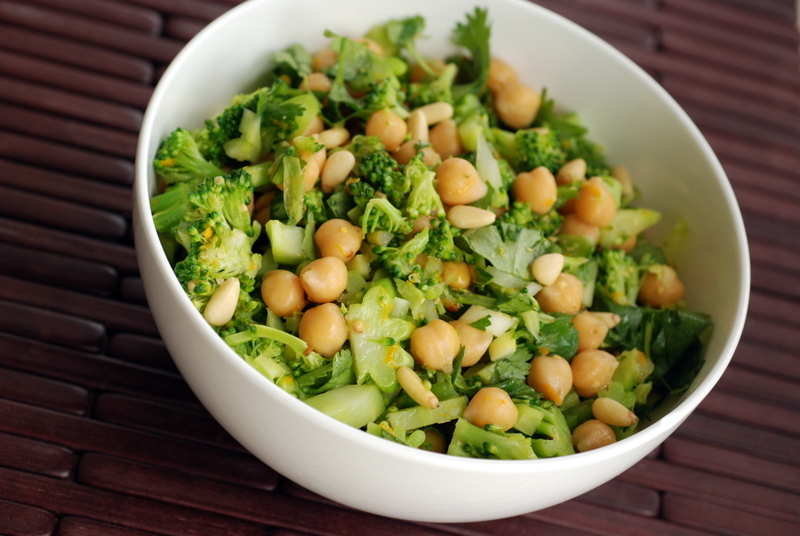 Sometimes I use kale or collards, sliced into thin strips, but this time I used a crunchy cruciferous mix of kale, cabbage and brussels sprouts for more variety. 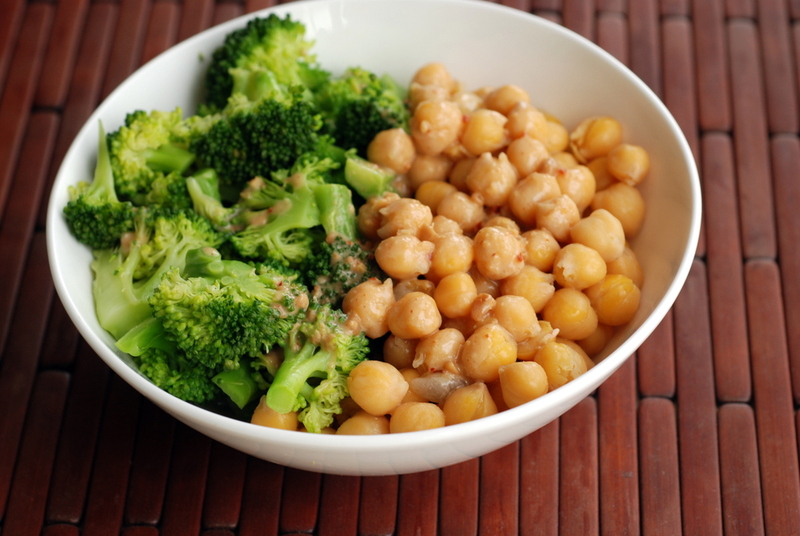 I also continued with the green theme and used frozen edamame as my protein of choice. It fits well with the uniquely Asian twist brought by the last minute addition of shredded nori. Like the recent article in The Guardian addressed, You can’t detox your body. It’s a myth. So how do you get healthy? 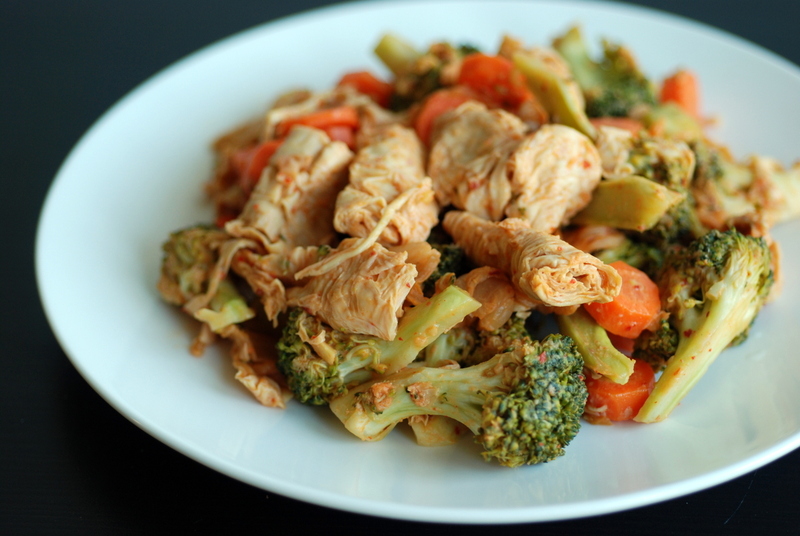 A healthy mix of vegetables with protein is indeed the way to go. Everything I thought about recovery is a lie – An excellent post about recovery from an eating disorder. Why do pigs oink in English, boo boo in Japanese, and nöff-nöff in Swedish? – Rob has always wondered why Polish dogs say “hau hau”. But do you know what noises porcupines make? Very cute noises. A Warning on Nutmeg – Beware of nutmeg overload! Secret Lives of Passwords – What does your password say about yourself? I am sharing this with Souper Sundays and Shaheen’s Eat Your Greens. 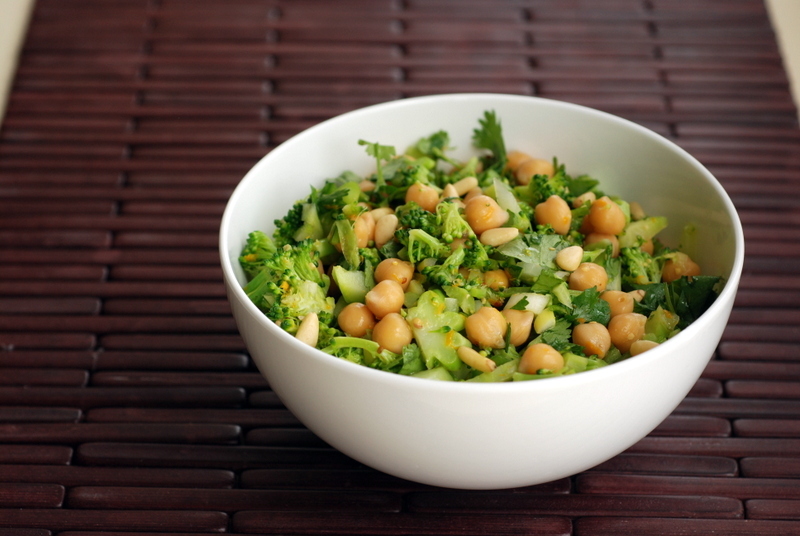 One of my more popular salads is my spin on Whole Foods’ Detox Salad. I used lime and cilantro to complement the riced vegetables. I named mine “Broccoli and Cauliflower Salad with Lime and Cilantro” because I cringe when I hear the name “Detox Salad”. In general, I always assumed that the enzyme myth was in fact, just a myth….. until I saw this video. (That long pause is Dr Gregor’s hallmark, at least in my mind). 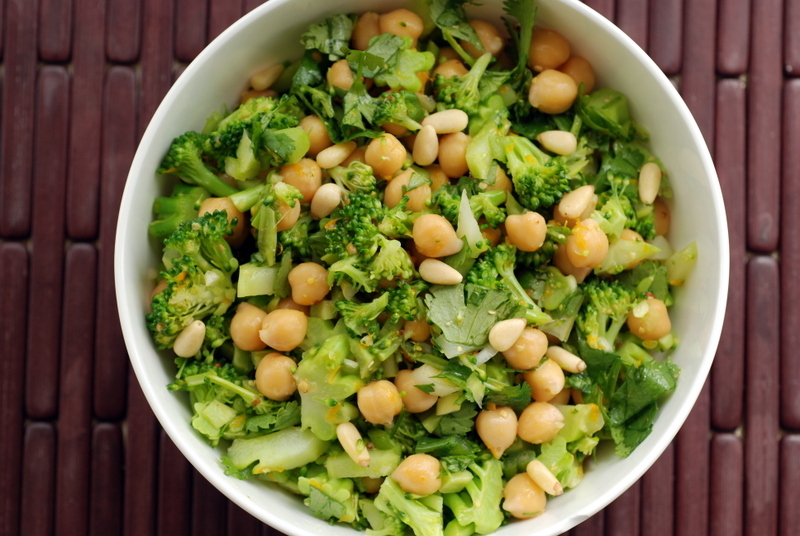 In this other video, De Gregor highlights the presence of sulforaphane in broccoli which enhances liver enzymes, as the most potent natural phase 2 enzyme-inducer. 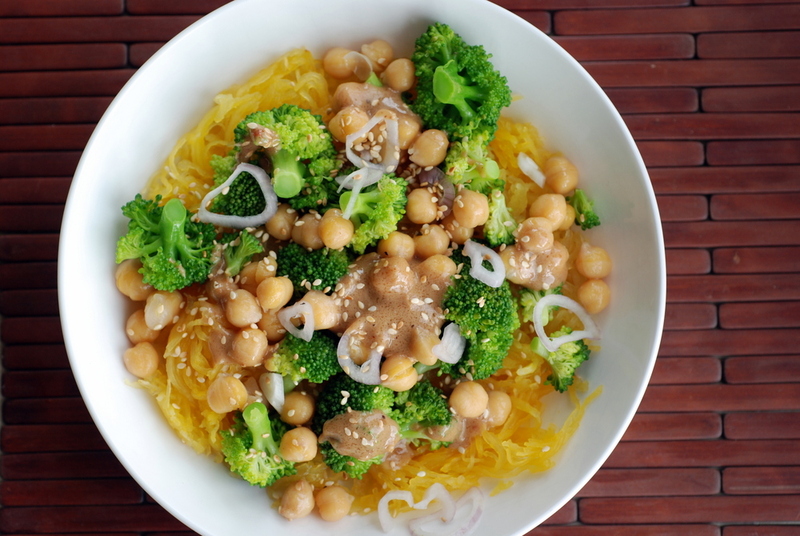 However, since sulforaphane is only created when two components interact, until you crush the raw cells (ie, with chewing or chopping), you miss out on sulforaphane. He later mentions that this needs to be done prior to cooking broccoli. Yes, the “enzyme myth” is true. 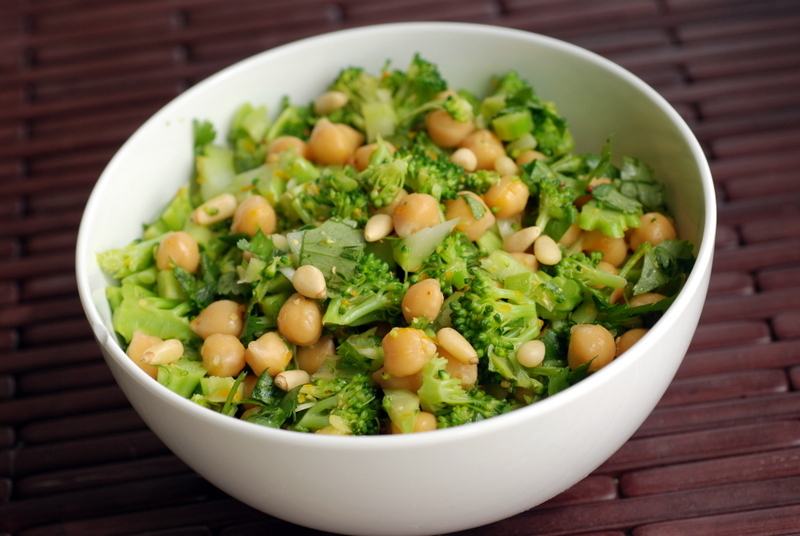 Cooking is not as good for the broccoli’s sulforaphane levels. But who likes raw broccoli? To get the best of both worlds, a fun solution would be to chop your broccoli, wait a bit for the enzymes to work and then cook it. And yes, this was my round-about introduction to this lemon-cilantro chickpea salad with almost riced broccoli, which I actually steamed for a gentler taste. 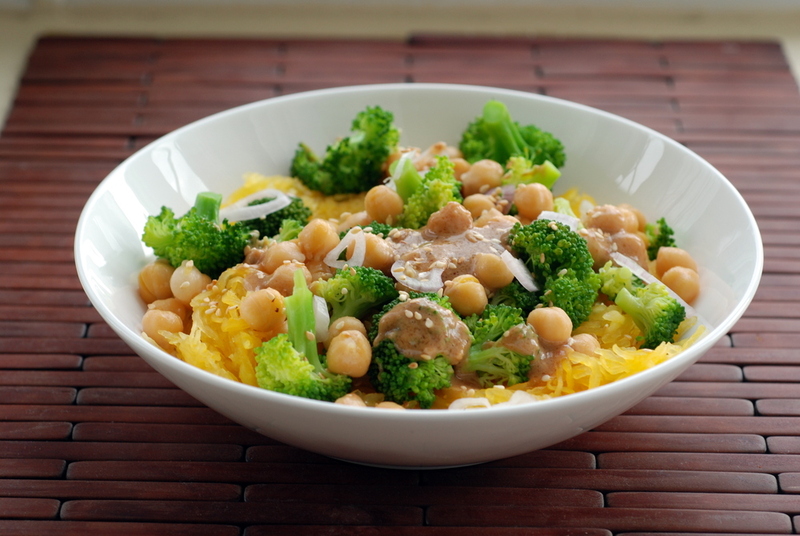 Although, you are completely free to try this with raw broccoli rice, too. The lemon juice would make it tender, too, with time. I am sharing this with Souper Sundays, No Croutons Required and Bookmarked Recipes. Did you know that Trader Joe’s is not in Canada? The closest thing we have (well, those who live in Vancouver) is Pirate Joe’s. They temporarily renamed themselves Irate Joe’s as they were being sued by TJ’s. TJ’s lost but is continuing to appeal. In any case, we’re getting our fair use of TJ’s while still in Houston. Sadly, though, it took me 10 months to locate their perfect salsa. Their chunky salsa is totally my favourite. Perfectly spiced with a robust tomato flavour, I love it. I also managed to go through a container in less than a week. I started adding it to everything. In fact, this is such an easy recipe, it is almost non-recipe. I envision this as the perfect travelling meal – mix and eat. Until then, it will have a happy place in my kitchen. 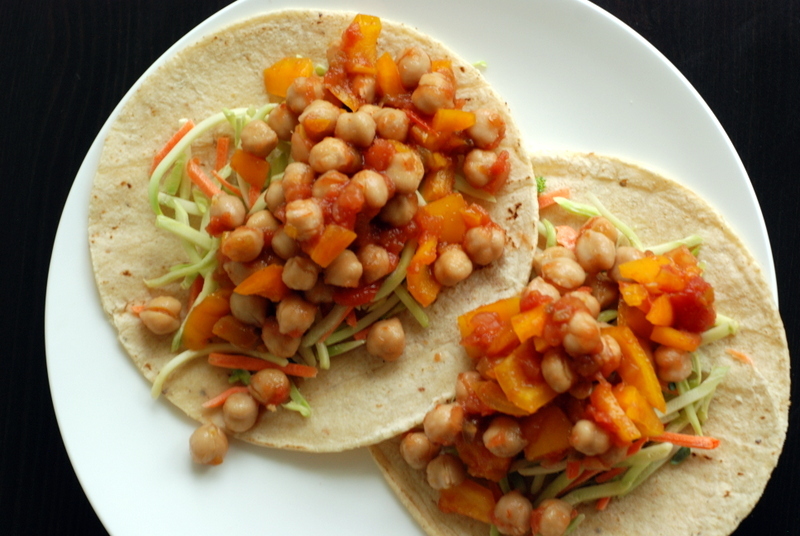 Mix some salsa with chickpeas and chopped bell pepper. 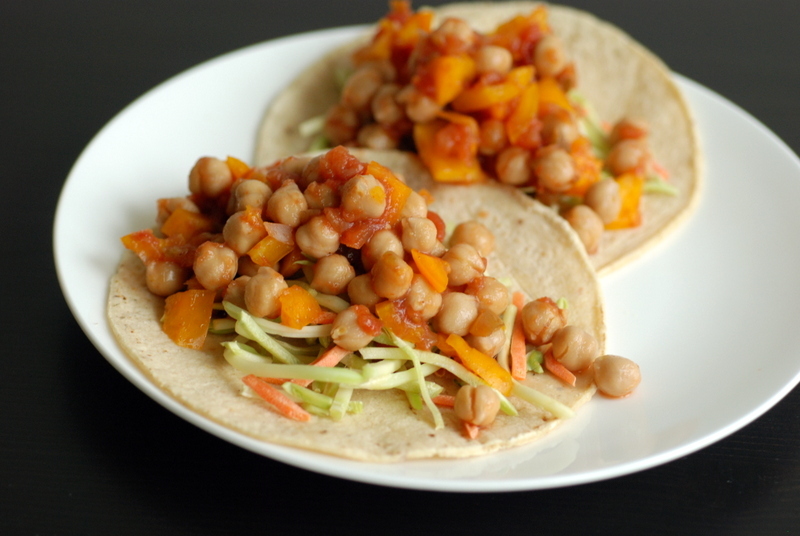 Throw it overtop some shredded broccoli and carrots for more crunch on a taco shell, and you’ve got a meal. I topped mine with a healthy dose of nutritional yeast which became creamy and gooey with the extra salsa. Totally not optional for those who love nooch. After nearly 10 months in Houston, you’d think we have settled in. I (only slightly) notice when people say “y’all”. The humidity is slowly building up past my Toronto summer thresholds. All in a regular Texan day. And then, a few months ago, we spotted a new-to-us animal. Half-turkey, half-duck, we had no way to ask locals about it other than “Have you seen the turkey duck?”. I have a feeling I am getting the same look from you right now. Turkey duck?? The crazy Canadian Canucks following the ducks. My googling suggests these are Muscovy Ducks and are rather invasive, almost pest-like. Probably similar to Canadian geese. I don’t get excited about them, either, but I am sure tourists love feeding them. Rob and I are also starting our purging of the pantry/fridge/freezer. Rob is better at experimenting but he ran with my crazy idea. 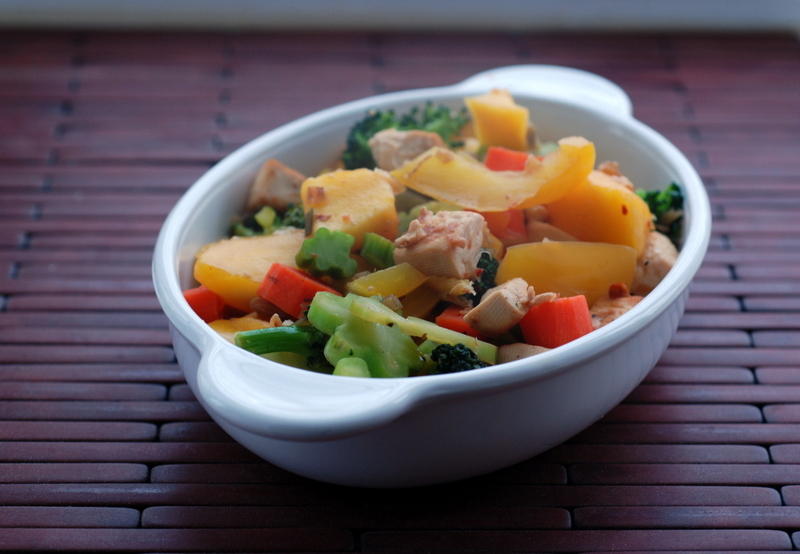 He wanted a veggie-centric stir-fry and I helped him with the sauce. And for some reason, it hit me. What better pair for sour than a sweet chili sauce for a spicy-sweet kick? YES! Rob added lemon pepper seasoning, too. 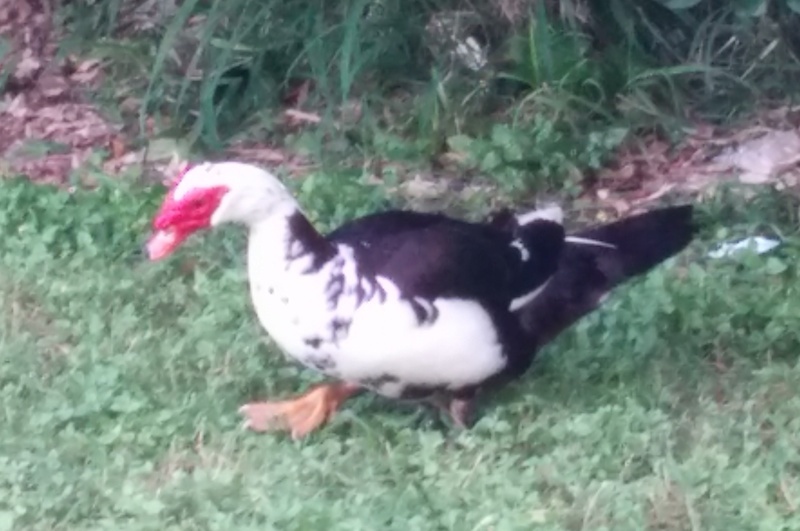 Have you seen a Muscovy duck before? Do you have any exotic pests where you live? Thank you, guys, for pointing out some technical difficulties with my last post. Everything should be working fine now, so don’t miss your chance to win a new cookbooks and try out a fabulous recipe for Cuban beer-infused black beans. Hopefully I haven’t beaten roasted cauliflower to death yet as it is my favourite way to eat it. But, have you tried roasting broccoli yet? Because, this was so revolutionary that a stranger came up to me at a grocery store, as I was picking out a head of broccoli. 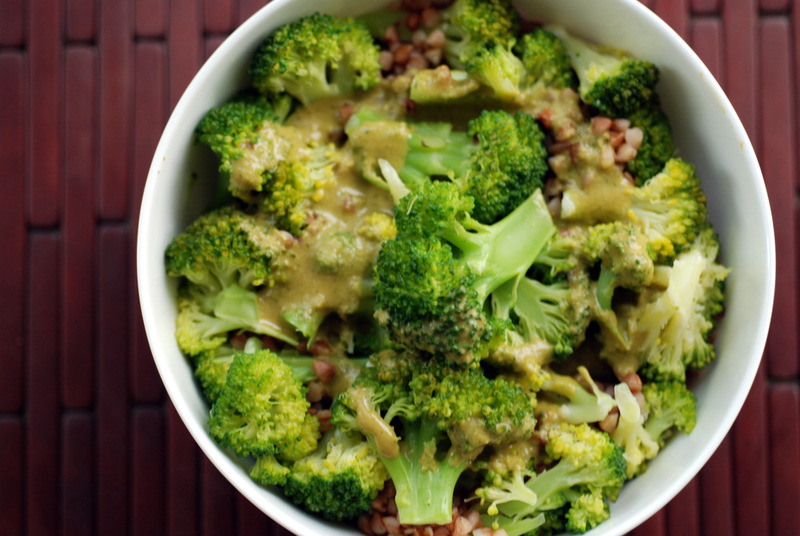 Have you tried roasting broccoli? OH MY GOSH. SO GOOD! In my head, I was thinking: Yes, of course, I have tried it. Broccoli is great roasted! While you could just roast the head, I have got you covered with more creative options: a delicious Forty Clove Chickpeas and Broccoli and even atop a Roasted Veggie and Kale Pizza (with a quinoa-bean crust). But it is true. Roasting broccoli doesn’t happen nearly enough. We usually opt to steam it so I decided to roast this newest head. While you can simply roast broccoli with nothing more than a touch of oil with some salt and pepper, I dusted it with curry powder first and then broiled it until it was slightly charred and tender. I then added it to some pan-roasted tomatoes and carrots, quinoa, fresh arugula and toasted cashews topped with the piece de resistance: quick-pickled raisins conferring a salty-sweet-acidy tang, nicely balancing the whole dish. 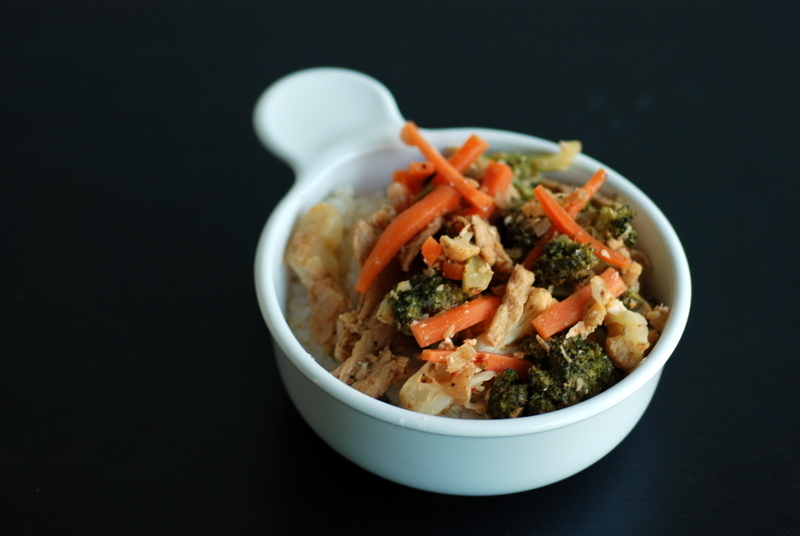 The recipe inspiration came from Joe Yonan’s Eat Your Vegetables and his original recipe is for a single serving. This would be way too much work for a single meal, so I doubled it. Furthermore, I recommend doubling it again to last a few more meals as you’ll love the mix of flavours. 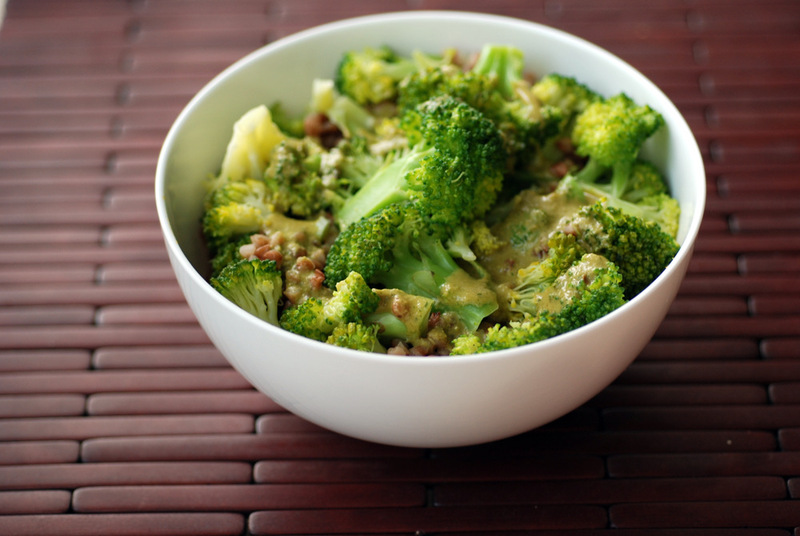 Have you ever tried roasted broccoli? This is my submission to this week’s Souper Sundays and this month’s No Croutons Required. Thank you for all your kind words about my knees. Thankfully I had friends and co-workers (AND ROB!) to help with my (on-going) recovery. Unlike my sister-in-law who is still driving herself to work (her [now confirmed] broken toe is on her non-driving foot), Rob has been driving me to work. Not that I couldn’t drive myself, but he is just that awesome. He has also been helping me around the kitchen. He made the cheezy chickpea dip again although I was to blame for the burnt coconut bacon, as Rob tended to a broken beer bottle. The beer bottle that exploded (from the bottom), after the rice vinegar fell on it which was knocked over when Rob was putting back the liquid smoke. Oh my. He also revisited some old favourites like tamarind lentils and my lemon-ginger miso soup (Rob’s addition were carrots, parsnips with some noodles and I then added extra sauteed mushrooms and baby spinach to mine). Yum! Rob also has been steaming up broccoli like a pro. 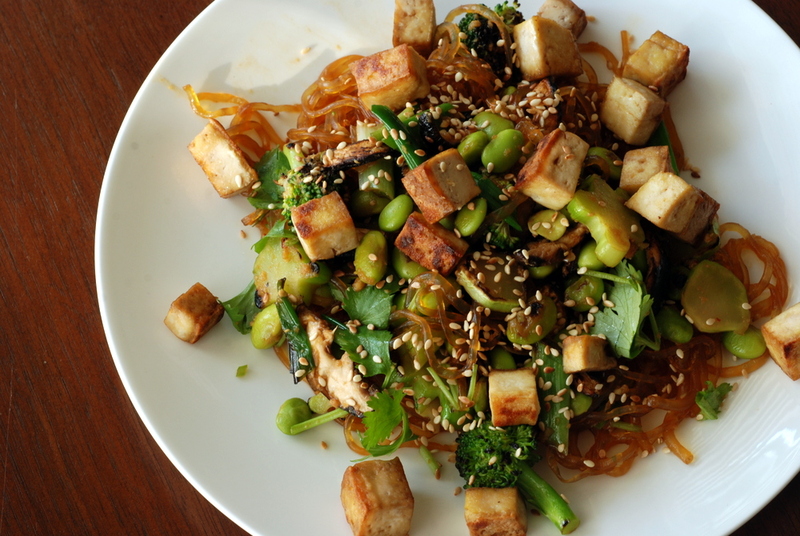 For this dish, he went all out with a sauce, tofu and noodles. 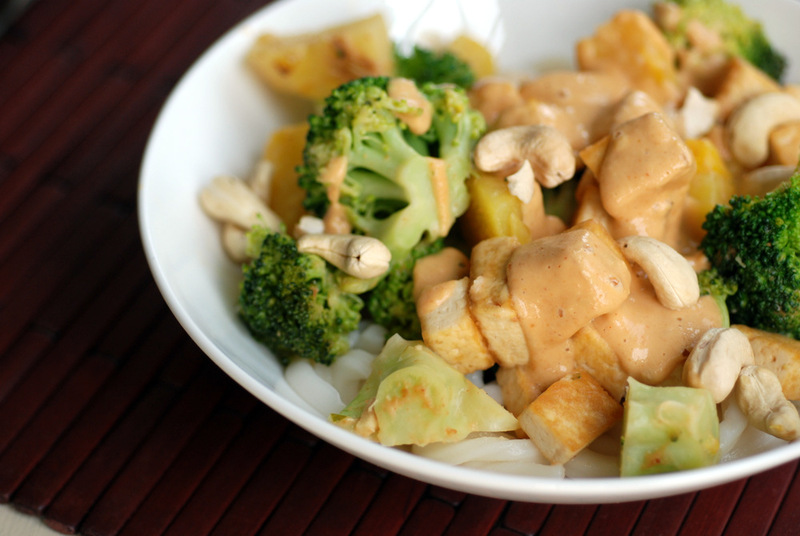 The pineapple was a fun twist on a Hawaiian noodle bowl with a peanut sauce. I love how the pineapple was used to sweeten the sauce directly. Ginger and sriracha made it a bit zippy but this was all tempered by the sweetness from the pineapple. While Rob was busy in the kitchen, I caught up on my web reading. Which also meant that Rob’s to-read list got longer as I punted them to him as well! Like my last link share, I figured you may enjoy them, too. There are a few travel-related links here. You know that I like to travel but you may not know that Rob loves travelling, too, and spent over a year abroad backpacking in Southeast Asia and Australia/New Zealand before we met. He wrote about that on his blog. 1. 10 Things Most Americans Don’t Know About America. This actually rings true based on my experiences, too. 2. 20 Things I Learned from Travelling Around the World. Rob concurs. 3. Date a Boy Who Travels. YES! No offense to boys who still live with their parents. OK, maybe just a little. 4. Ben & Jerry & Me. What do you get for naming a Ben & Jerry flavour? 6. Raw. Vegan. Not Gross. I don’t watch many videos on youtube but this one is great! 7. Is Pro Cheerleading a Scam? I honestly had no idea but then again I am not into football. 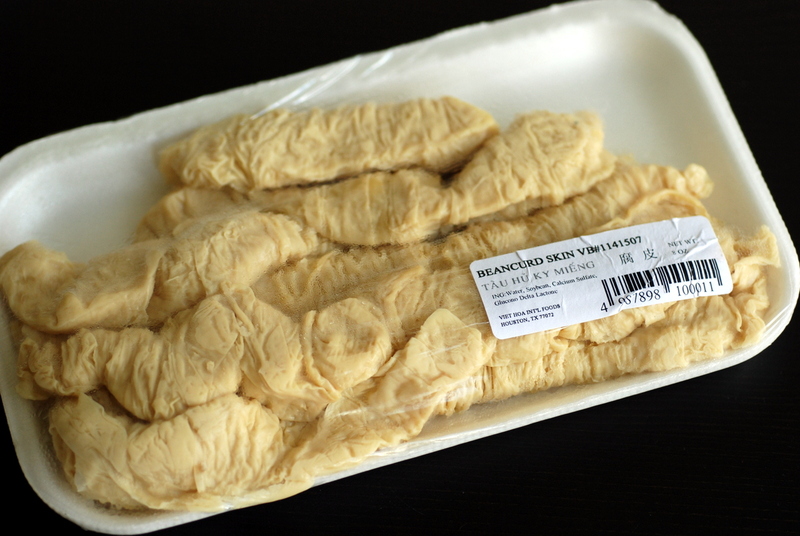 Also known as yuba, bean curd skins are made from the thin skin that forms on top of the tofu while it is being made. It can be bought fresh, frozen or dried. If it is dried, it needs to be soaked for at least 8 hours but the fresh ones are ready to go, as is. A bit more googling, taught me that yuba has been gracing higher end restos lately. I would believe it. Because let me tell you, they pack the nutritional punch of tofu with a nice, new texture. While they were new to me and Rob, this did not stop Rob from making a fabulous random stir fry. 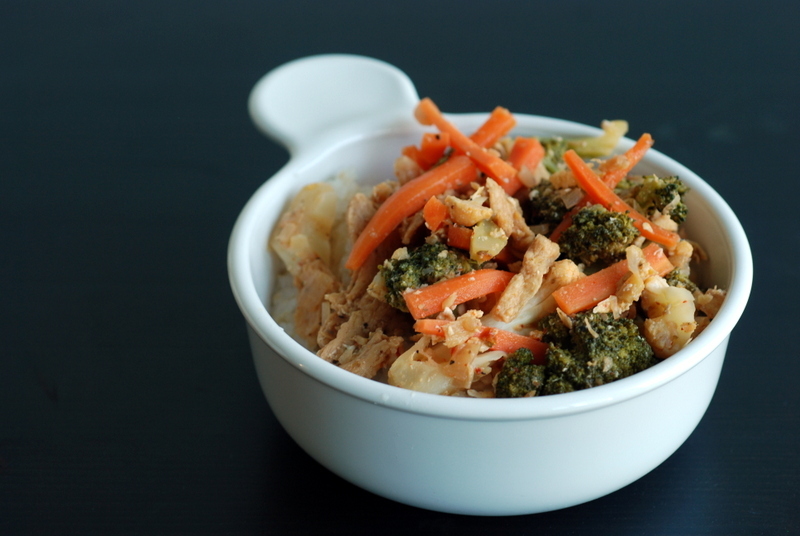 Tender crisp vegetables are a must for a stir fry (broccoli and carrot here) along with your typical aromatics, like ginger and garlic. While the tofu intestine bean curd skins were an amazing textural foil amongst the vegetables, the flavour explosion came from Rob’s addition of kimchi and miso to the mix. Yeah, bliss. Now for a shout-out to Viet Hoa, the grocer where we found the tofu intestines. It is possibly the biggest Asian grocer I have encountered. They have a lot of fresh produce and aisles upon aisles of other Asian goodies. They honestly have a whole section for noodles and a large room solely for rice. Sadly, their brown rice selection is not as plentiful and they don’t stock our favourite brand (but I did find whole oat groats amongst the rice, crazy eh?). Total props goes to their tofu selection which covers nearly an entire aisle. Not only are there multiple varieties of traditional tofu, they also had fun bean curd shapes, such as these tofu intestines and small bowties. However, it was their selection of mock meats that made our jaws drop. As you know, I don’t usually eat mock meats (other than the seitan I’ve made myself), but they had an entire freezer aisle dedicated solely to vegan mock meats (see below: Rob snapped some photos with his phone). I am not talking Gardein and the like. Mock chicken, salmon and ham but also mock abalone and sea cucumber made from seitan or soy. Explore a bit more and they have dried seitan and bean curd in fun shapes, as well. I swear, I have never seen so many versions of mock meat/tofu in one place. This is my submission to this week’s Weekend Herb Blogging, hosted by Lucia. In addition to cycling through Houston, Rob and I are also discovering Houston, one grocer at a time. After chowing through our organic produce, we started exploring my hitlist of ethnic grocers, one weekend at a time. First of all, though, our Rawfully Organic broccoli lasted 3 weeks. WOAH! Gotta love that! Second, because I love Asian produce, the first ethnic grocer we picked was H-Mart, a Korean market. It is a chain that has branches as far as California and New York, so you may be familiar with it. It reminded a lot of T&T, actually. 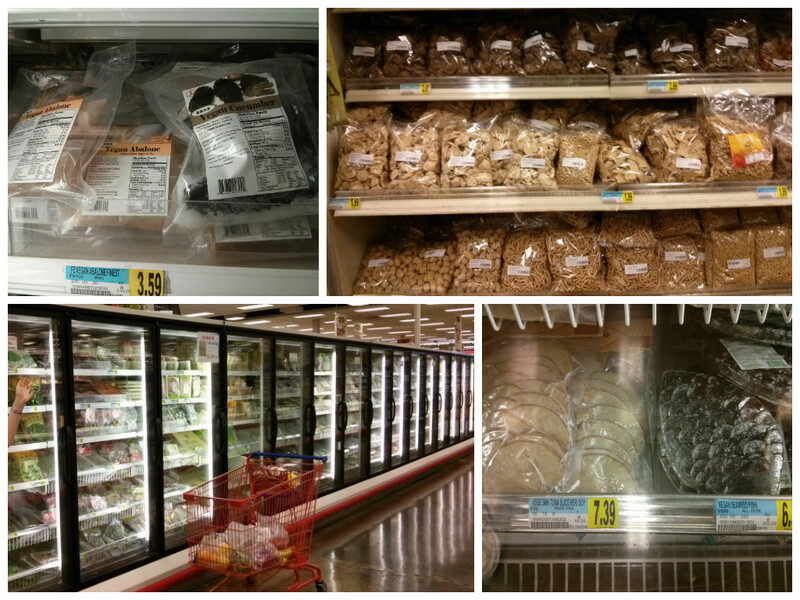 A large, clean store with fresh produce, mostly Asian with a heavy Korean slant, with reasonable prices. They had a whole giant section just for kimchi. Rob picked out a house-made vegan kimchi for us to try. Turns out it wasn’t as blow-off-your-face hot as kimchi can be… score for me! We also picked up a few different bags of brown rice. I am very particular about my brown rice and we both absolutely loved these finds. While both are short grain brown rice, the Sukoyaka Genmai Brown Rice produces the most fluffy and sticky rice (that doesn’t even taste like brown rice, imho). I can’t seem to find the other one online (it is made by Organic Farm and is a 50/50 blend of organic short grain brown rice and brown sweet rice). It requires a 2 hour soak, but it is very nice as well. Not sticky in the slightest, and less aromatic, but good rice. I was quite impressed by their wide selection of brown rice at H-Mart, which is usually hard to find. Now the dilemma will be whether to gamble and try a new brand or stick with these two we like a lot. Lest you think we have gone all raw here, have no fear. A perfect rice bowl, akin to Korean bibimbap, complete with fresh rice waiting for me when I come home from work (thank you, Rob). 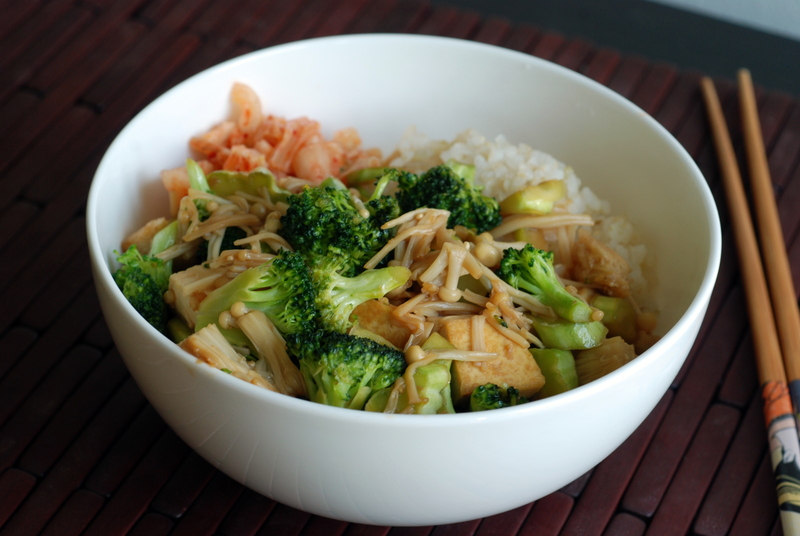 A quick stir fry with tofu, broccoli and enoki mushrooms in a sweet maple infused sauce that is matched well with a side of not-so-fiery kimchi. I think I’ve mentioned it before, but we’ve made the quickie kimchi from Vegan Eats World, although it is really spicy if you use the full amount of Korean chili flakes. I am quite partial to the ginger-only version, actually. 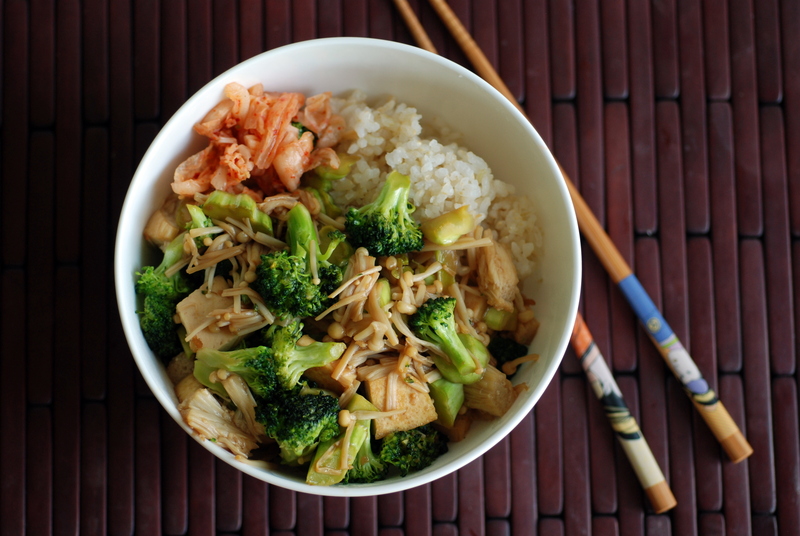 So, have you ever been smitten by brown rice? What is your favourite brand? I am on a kasha-kick. At least until my stash runs out. The millet evaporated last summer. Next went the wild rice. Now I am plowing through the kasha. 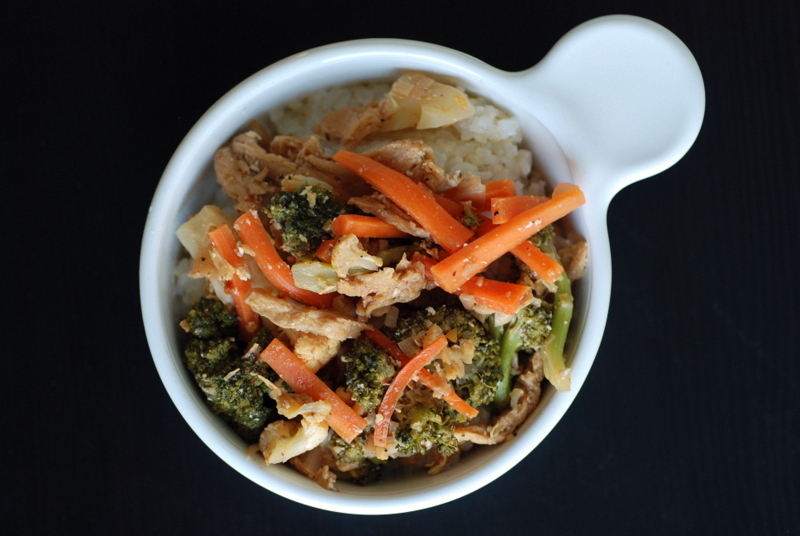 Once I discovered the boil-in-a-bag stuff, I was smitten with it as a base for veggie-based bowls. 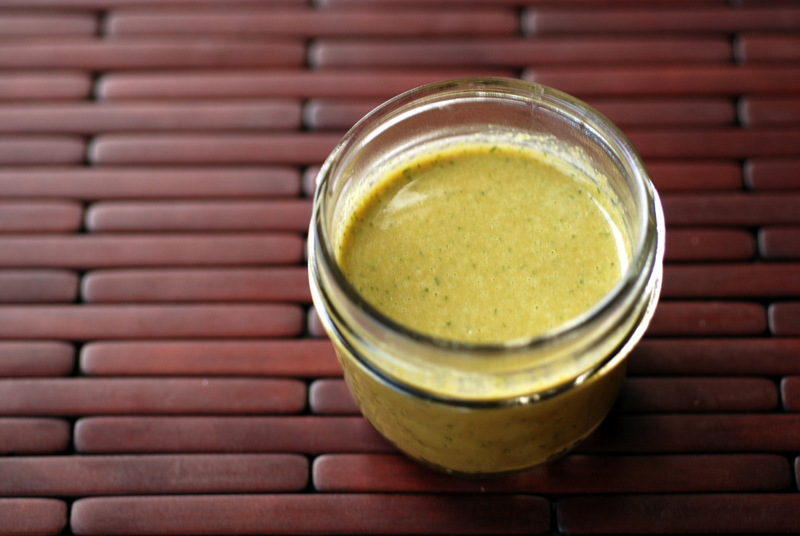 With a focus on simpler meals, I made the dressing first and then decided what to toss with it. And yes, this was a glorious dressing. It seems so weird. Raw onion? Dill? Miso? But trust me, it worked so well. 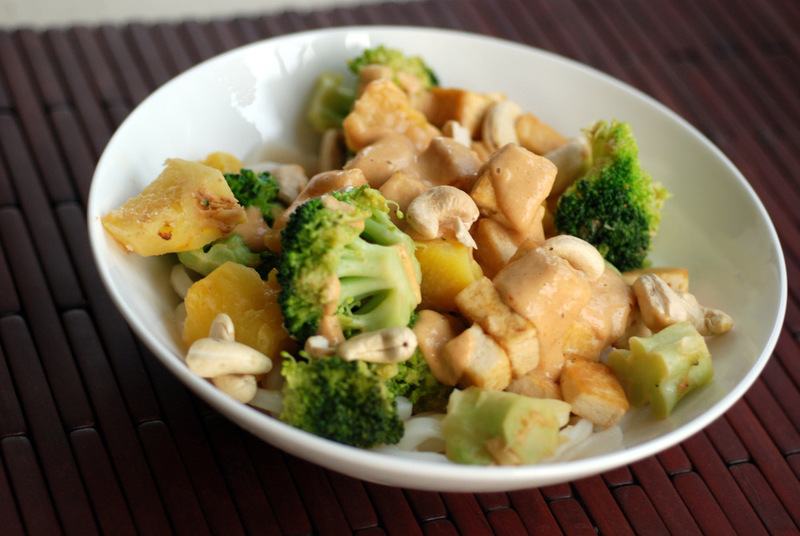 I also tried a creamier version with tofu-cashew mayonnaise and liked that, too. I picked kasha, but any grain would work here. Brown rice? Quinoa? 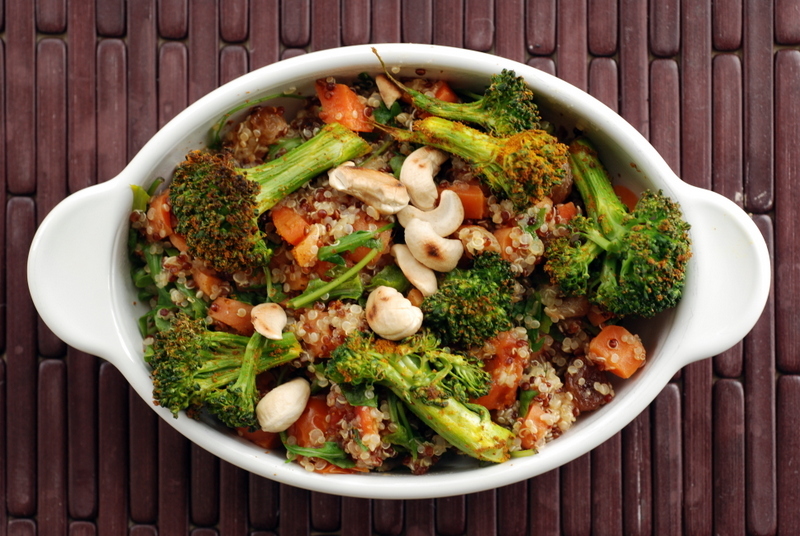 Choose your favourite veggie but broccoli complemented the tangy dill-miso dressing well. This is my submission to Deb for this week’s Souper Sundays, this month’s Random Recipe for healthy foods and to this month‘s Herbs on Saturday. Are you familiar with The Dish column in the Toronto Star? They routinely give the nutritional stats of local eats based on laboratory analysis. Not surprisingly, most meals get a failing grade. And what about vegan eats? Not any better. Urban Herbivore’s sweet potato date muffin (just one! one muffin!) is 986 calories and 689 mg of sodium. And Fresh’s Green Goddess Bowl (steamed bok choy, kale, swiss chard and broccoli with grilled tempeh, pickled ginger, toasted sunflower seeds, tahini sauce, toasted nori and ginger tamari sauce) is only 687 calories with 647mg of sodium. Moral of the story? 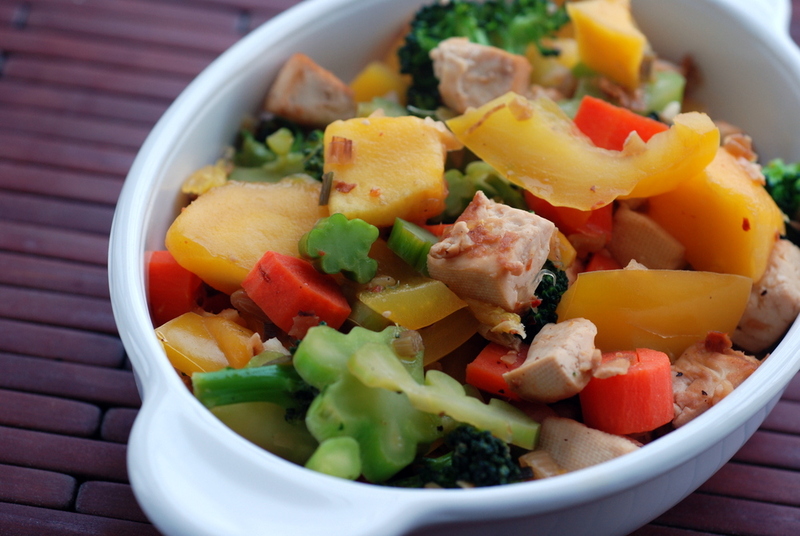 If you are eating out, be mindful of your portion sizes and the amount of non-veggies…. and preferably, only eat half your meal. The portion sizes are so huge at my beloved Hot Beans that it is equally wise to share a meal there, too. This always encourages me to try my hand at making the food at home, more in tune to my regular portion sizes. The culprits for the giant calorie counts are mostly due to the sheer amount of food, including heaping portions of rice and rich sauces. 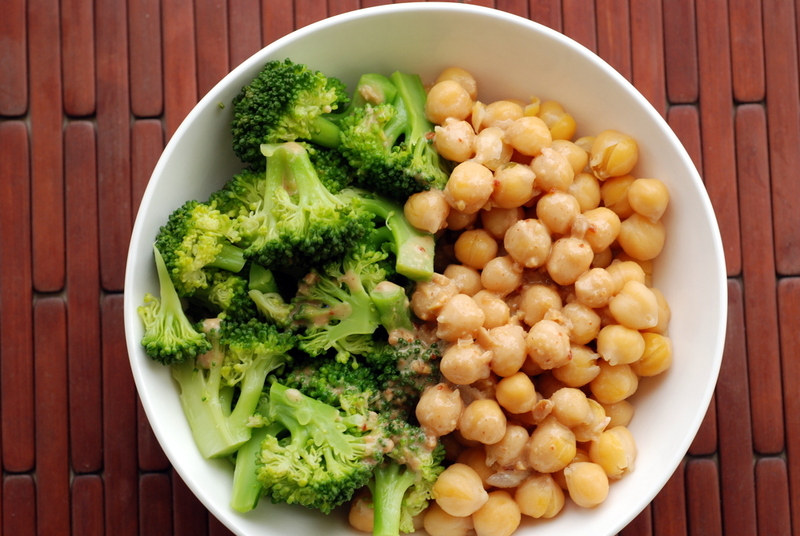 Fresh’s Green Goddess Bowl is lighter because it is filled with less caloric dense green veggies. 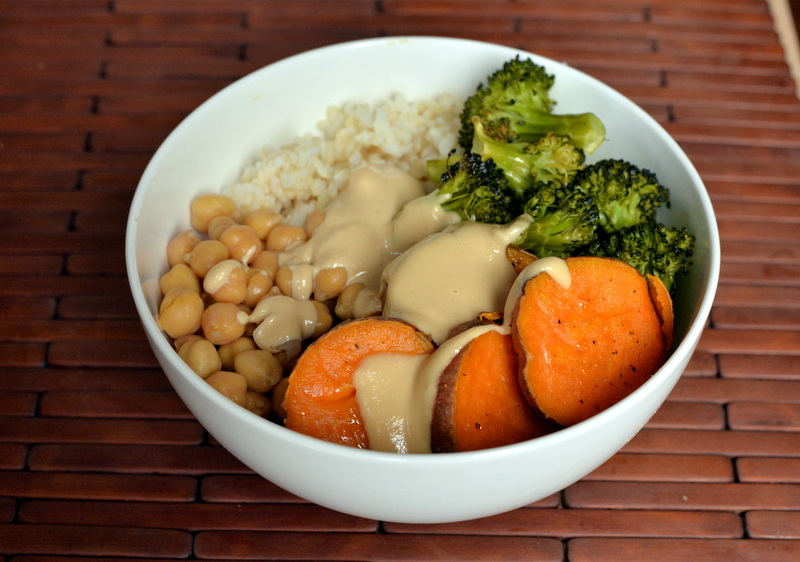 And yes, because I still couldn’t get Hot Bean’s peanut miso sauce out of my head, I made another version. 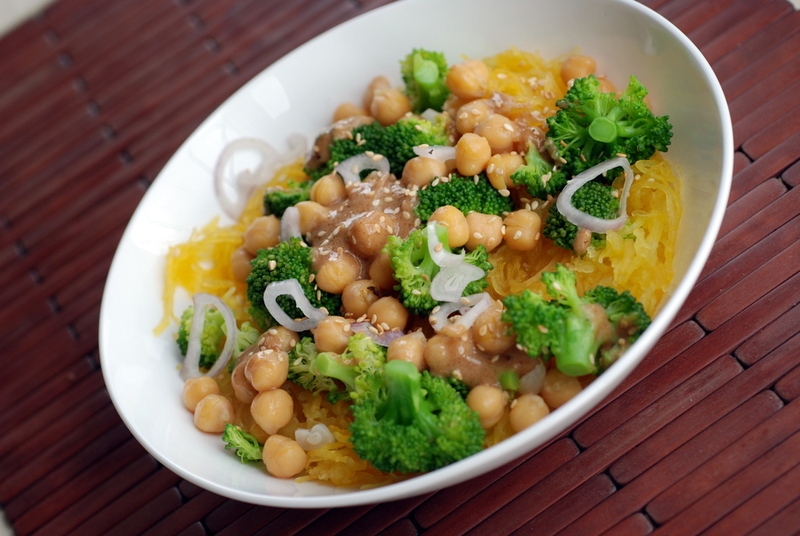 Last time, it was just chickpeas and broccoli but this time I went more extravagant by adding spaghetti squash, shallots and sesame seeds to the chickpeas and broccoli. I also wanted to test my theory of a thicker sauce by using some toasted sesame oil with the peanut butter and miso dressing. Compared to my last attempt, this dressing was thicker, coating the veggies nicely. 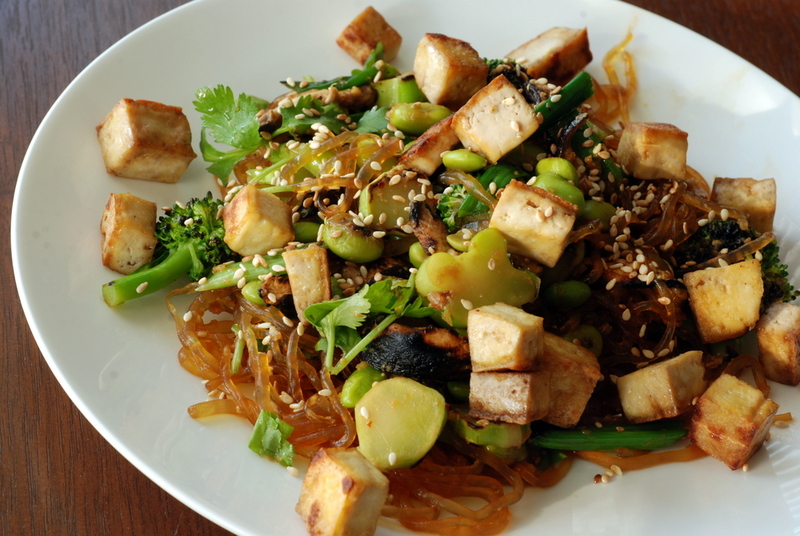 This version also had a more pronounced sesame flavour from the toasted sesame oil. In fact, a little of the sauce goes a long way. Big bold flavours means you don’t need to use as much. If you like it to cover everything, thin it or make a double batch. Both dressings were good, though. Side-by-side, I preferred the first dressing (I like dressings a bit more tart) whereas Rob preferred this one, but it was close. This is my submission to this week’s Weekend Herb Blogging, hosted by Elena, and to Cate for Anyone Can Cook Vegetarian legume dishes. Stir fries may be easy but I find bowls even easier. Each week, I try to make a dressing so that I can use up bits and bobs from in the refrigerator. 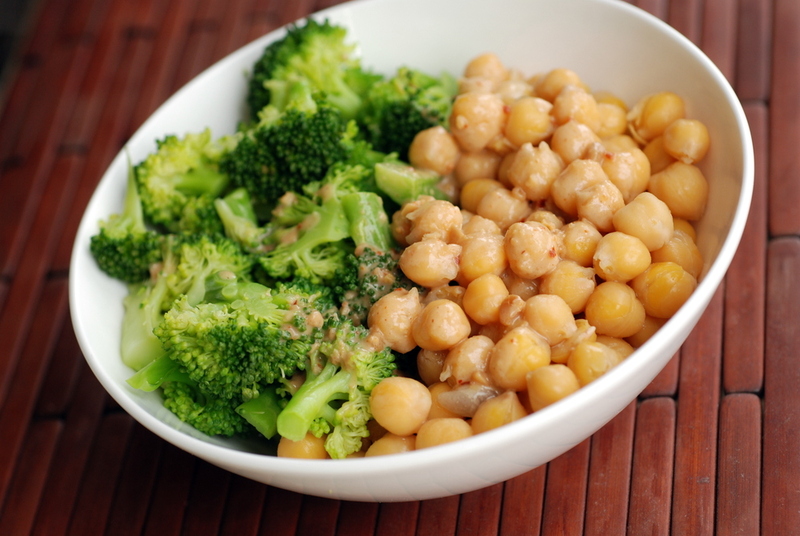 Leftover grains, pre-cooked beans and steamed veggies can become a delicious meal with the right dressing. This was one of those meals where I was searching for the perfect dressing. 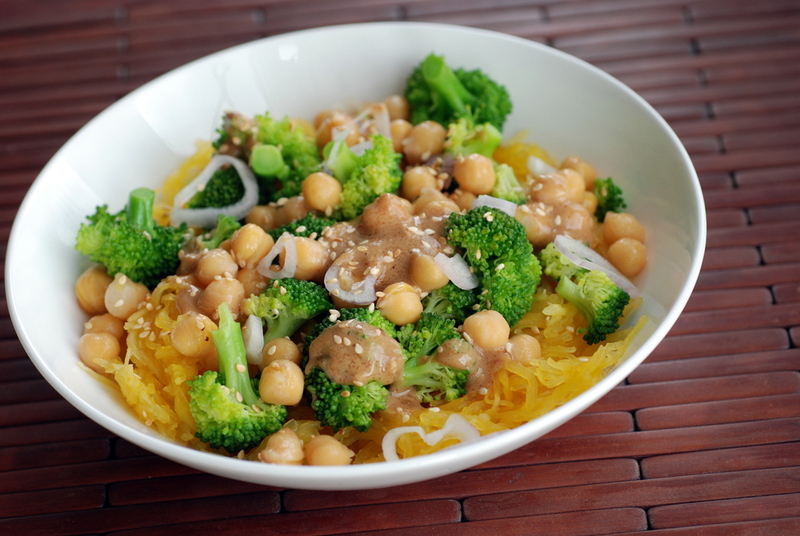 I wanted to make a peanut-miso dressing. I digress. Tahini and miso are a common duo, but I never would have thought to pair peanut butter and miso until now. But it works really, really well. 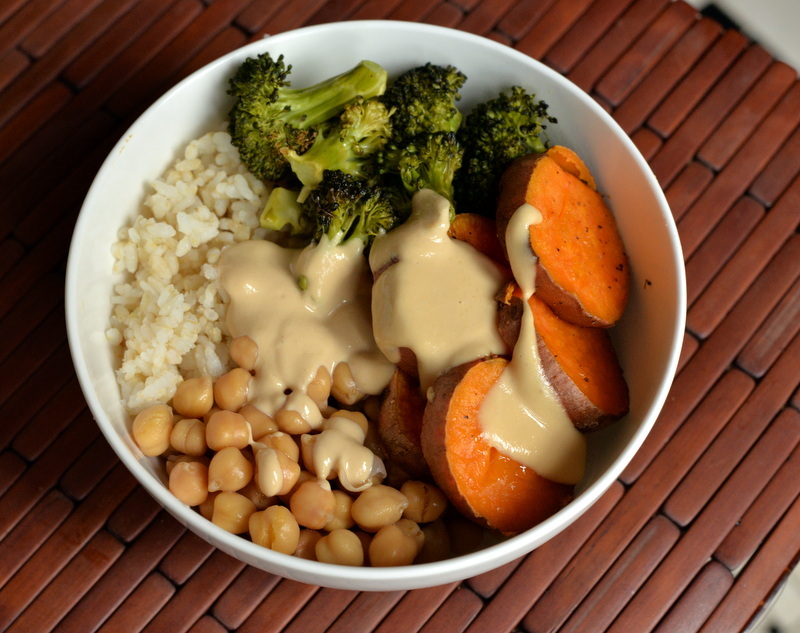 While I would have loved to duplicate that whole big burrito bowl, I settled on recreating the peanut-miso sauce and paired it with some classic ingredients: chickpeas and broccoli with some quinoa to sop up the dressing. Since I was experimenting, I did a lot of sampling. Rob helped, too. Too vinegary? Added a touch of agave and more peanut butter. Now, the sauce was perfect. I kept dipping my finger in again and again. I will warn you that the sauce was a bit thin. A rule of thumb is that your sauce is supposed to coat the back of spoon, but this one was definitely drippy. I didn’t notice while I was sampling it until it shimmied off my chickpeas a bit too easily. Perhaps using less water, thinning with coconut milk or adding some oil would help if that is important to you. I just ended up tossing in some quinoa to catch the last of the sauce goodness. 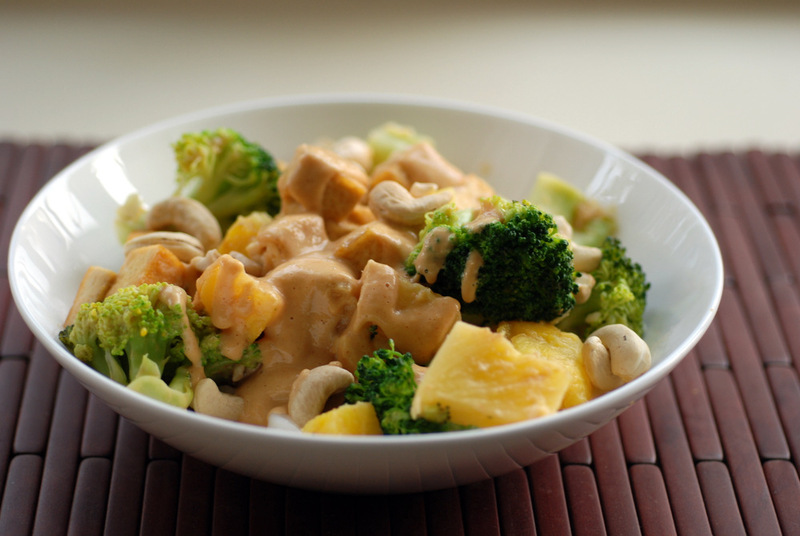 What is your favourite peanut sauce? I thought Alphonso mango season was still a few weeks away but it turns out now is the time! They are here from India! Alphonso mangoes, one of our favourite mangoes, have a short season. Juicy, sweet and less stringy, the Alphonso mango is a treat. We eat them fresh, dripping their juices over the sink. Thankfully, I am not going to tell you to use Alphonso mangoes in this curry (we actually haven’t bought any yet, although that’s on the agenda for the weekend). Unless you happen to be a very lucky person, overflowing with so many mangoes you do not know what to do. 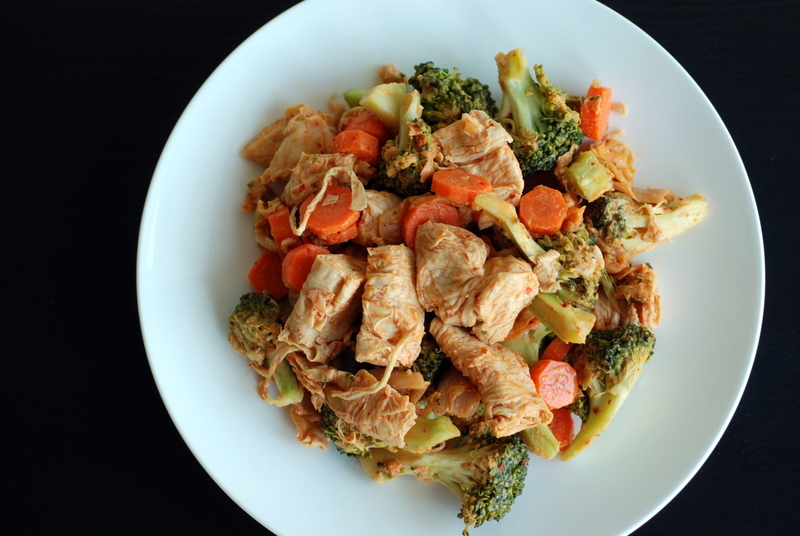 In a stir fry, ones that keep them shape are the best kind. 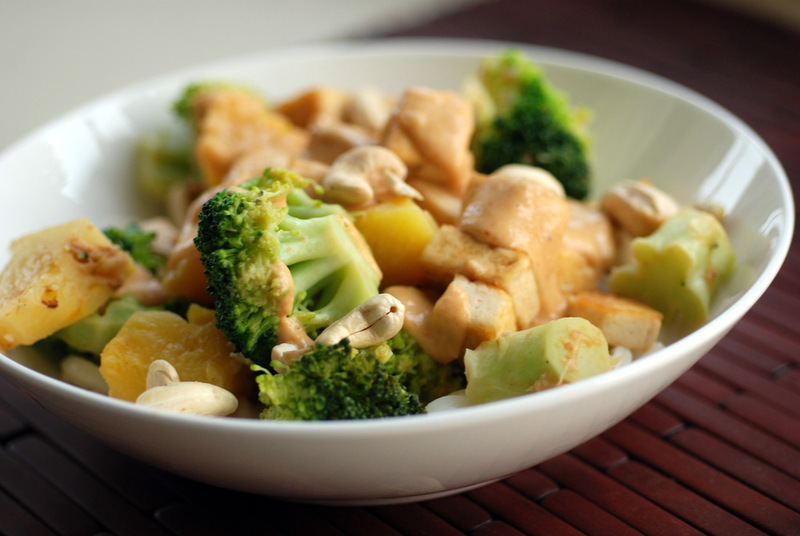 Since you pair them with other vegetables, you do not need to use expensive, sweet mangoes. As such, I used frozen mango chunks. And I could not tell you what kind of mango those are… but I know they are not Alphonso. 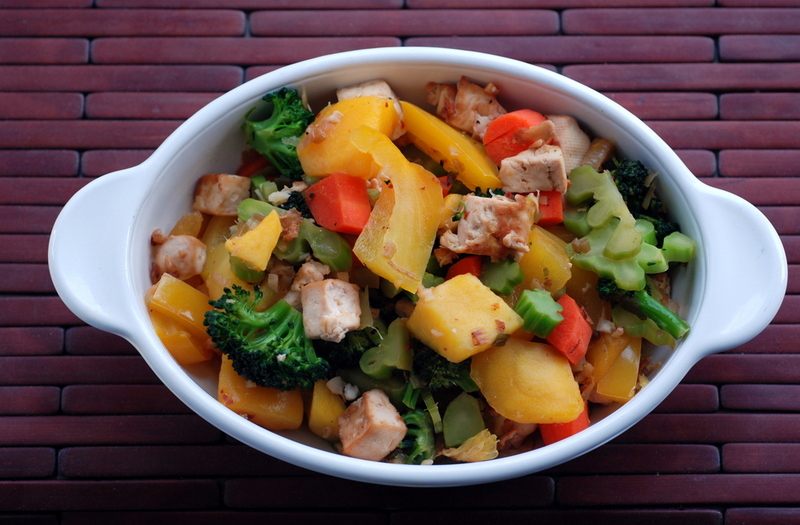 Crispy tofu mixed with a medley of vegetables – tender crisp broccoli, carrot and bell peppers – coupled with chunks of sweet mango. Frozen mango worked well as it is cheaper and moreso, they are firm, cubed and sweet, keeping their shape in the skillet. Tossed with a light, orange-based sauce flavoured with garlic and ginger and a heavy dash of red pepper flakes, there are a lot of bold flavours. The sweet balanced nicely with the heat, without being too overwhelming, even for my own heat-sensitive palate. Reminiscent of my Toasted Sesame Orange Teriyaki Vegetable and Quinoa Bowl, although that one is a bit more involved with flavoured tofu and a more complex orange sauce. I kept the tofu simple here to let the vegetables shine. Have you tried Alphonso mangoes yet? This is my submission to this week’s Weekend Herb Blogging, hosted by Graziana.